Props: Suitcases, Inflatable Sharks, Plunger, Toilet Brush, Elmo...really just too many to mention. 1: Come up with a general concept: We all have suitcases, we travel around the world, our suitcases get mixed up, funny things happen. 2: Walk through it and flesh it out: We each go somewhere (Rain Forest, for one example), we run into trouble (Snake puppet), we reach into our suitcase to get something to save us (like a net for Snake), but instead we find someone else’s thing (snowballs that were meant to be used in Antarctica). 3: Write a rough script with that pattern and filling in the pieces. 4: Walk through it again and punch it up. Around this point we came up with two key elements. One of us (Brad) has to stay behind and take care of things (specifically: clean toilets, since showing a picture of a toilet works equally well with grades K-5), so he is the trickster who sw itches our suitcases. Also, he’ll play a final trick on all of us: Pop out of his own suitcase and squirt us all and the audience with silly string. 5: Write up an updated version, knowing by now that it’s going to be changed a bunch still, but some of us (me for one) just need those written down words. 7: Perform a rough version for our last Family Storytimes of the spring. We use our four performances to work out the kinks, get some new ideas, and learn our parts. It’s a little tricky, since we develop it for K-5, not 3-5 years, but as Terri puts it: "The parents get the information, and the kids just like to watch us doing stuff." Meanwhile, we add more touches. For example, reaching a snake over the edge to hiss at Sheila is okay, but throwing it over, then pulling it back by the tip of the tail, is better. 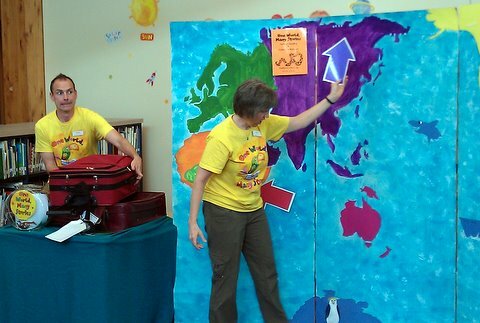 8: Perform for real for all 36 classes in 9 sessions at one primary school (in one day). Kind of grueling, but great fun, especially because they seem to enjoy it and retain the information pretty well. And Brad popping out of the suitcase surprises them every time. We cut holes in an old suitcase and an old card table, he secretly climbs underneath, and when we open the suitcase with plans to play a trick on him, he gets us good. 10: Perform another 7 times at our other elementary school over the next two days. By now we’ve got it pretty well down. One presentation got filmed by our local cable company, and we put that version on our City website, with a link from our library webpage. 11: Fiddle with it right to the end. I’ve been attacked by inflatable sharks and whack them with a brick 17 times when I realize it will be even funnier to whack them with a little stuffed Elmo for the last 3 times instead (if you want to know why those are in my suitcase you’ll have to watch the video). And after taking the same trip 19 times Sheila and I decided we wanted to switch, so I went to the rain forest and she took the ocean cruise and got to smack sharks. 12: Back at the library, we’re seeing what we hoped for: Lots of kids saying: “I saw you at my school,” and I’m sure our sign-ups and program attendance will be great. 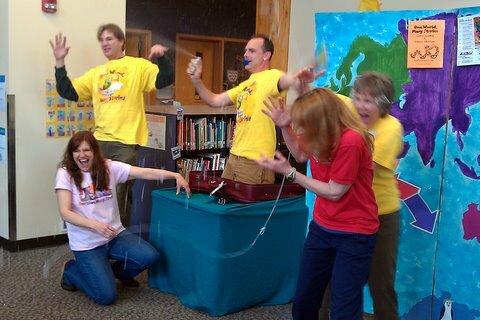 We put a ton of staff hours and a ton of energy into planning, practicing, and presenting, but the payoffs are worth it: High Summer Reading Program sign-ups and Program attendance are obvious goals, but even more important, we see 1,600+ kids who are reminded that the library is a fun place, the staff are nice (and they know our faces and maybe our names), and that reading is cool. Here’s an excellent book to use in Toddler Time, then follow up with puppets. The patterned text reads: “Who needs to be tucked in? ‘I do,’ says Zebra [or Hedgehog, Peacock, etc.]. 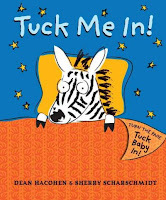 Good night little Zebra.” And as you say the good night, you move the flap in the shape of a blanket from left to right, neatly covering up the animal. Very simple and very effective. For a Follow-U p, I gathered a few cute puppets and some blankets. We have some fabric with animal patterns on them, so I decided to pull out the “bl anket” first and ask the kids whose blanket this might be. Then out pops Fish (or whoever) and we all say: “Good night, little Fish.” Then I wrap Fish gently in the blanket and bundle her on the table, where she’s soon joined by other blanketed animals. If you don’t have animal blankets, though, you could use anything…if you still want the kids to guess, you can give the sound (“ribbit”) or a brief description (“she’s green and she hops”) before the Pop-Out. The popping out really catches the kids’ attention, and to draw them in even more you can have everyone say a big: “Shhhhhhh…” as you put each bundled critter onto the table. It's fun to hear the sudden quiet in the midst of a Toddler Time as all the kids are earnestly silent as the animal goes to bed. 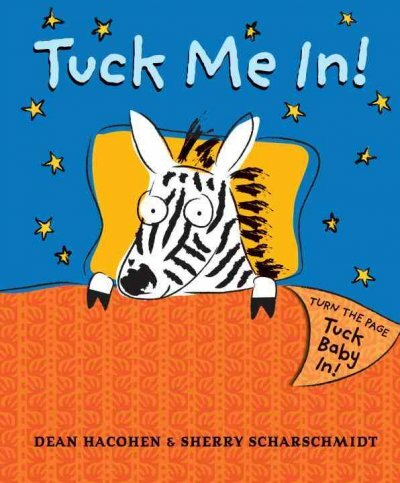 The book ends by addressing the kids: "Does anyone else need to be tucked in? Do you? Good night, you!" So the last blanket I pull out of my bag is a plain old baby blanket, and I ask them who this blanket is for. A yawn and a stretch clues them in that it’s for me, and I cuddle up with it. Alternately, you could tuck in a toddler or two from the audience. I tend to avoid that sort of thing because we have 20+ kids and there's a risk it would go on too long, but with a smaller group I'm sure that would be an even better finish. 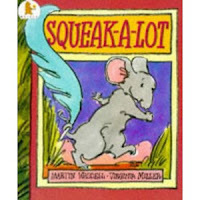 Squeak a Lot, Buzz a Lot, etc. Enjoyable Language: I stick to Waddell’s words pretty closely, especially for the opening: “In an old, old house, lived a small, small mouse who had nobody to play with. So the small, small mouse went out of the house to find someone to play with. And he found….” The bit of rhyme and repetition catches their attention and moves neatly and quickly into the heart of the story. Songs: You can make up any rhythm or tune for the songs. Mine is more of a chant that goes: “Buzz, buzz, buzz! [Bee] Buzz, buzz, buzz! [Mouse] Buzz, buzz, [Bee] buzz, buzz, [Mouse] buzz! [Both]” You can do some simple puppet work here, with each puppet dancing a bit during their part, then both going straight at the audience on the last buzz, with a little double take thrown in: both look at audience, quickly turn to each other, then back to the audience. The motion and pop-outs and song refrains are enough to keep the attention of ones and twos in a Toddler Time, but there’s enough story and humor to entertain fours and fives too. Morris says he can’t be It because he can’t count to ten. To prove it he tries: “1, 2, 3, 7, 12, 99, 4, 8…”  Very funny to a three year old. I tend to soften Boris a bit from his fairly grumpy self in the book, so I’ll have him say: “you’re right, you haven’t learned to count to ten yet, but you will.” Plus that makes me feel like I’m not making any listeners who can’t count to ten yet feel bad, which I’m sure is me being way too oversensitive, but it just feels better that way. For the final act, Morris tries being It, and since he can’t count to ten he sings a song: “Oh give me a home / where the buffalo roam / and the moose and the grumpy bear play / a game called hide and seek / and I better not peek / or Boris will yell at me all day.”  Or whatever you want to make up. Then Morris takes a quick look for Boris (“not here…not there…”) and says he’s going home, so Boris jumps out. “I found you!” says Morris  and kids totally get the trick he just played. If I have time I sometimes extend this by having them try another game: “catch.” (which adds another five surefire-laugh-out-loud-preschooler-moments to the total). Morris says he has a ball, but gets one that’s too big, like a beach ball. He throws it at Boris and it flattens him. Boris picks it up to get even, but it’s too heavy so he drops it on his own head and gets flattened again. They finally get the right size, play catch for a while, the Morris throws a high one that bops Boris on the head (yes, it flattens him). Boris throws it back hard at Morris to get even, but Morris ducks (“Missed me, missed me, now you gotta kiss me!”)  So basically, lots of playground-ish pranks that are right at the level of preschoolers. The story also works well as a puppet show with a stage, where the hide and seek bit can be played out even more. 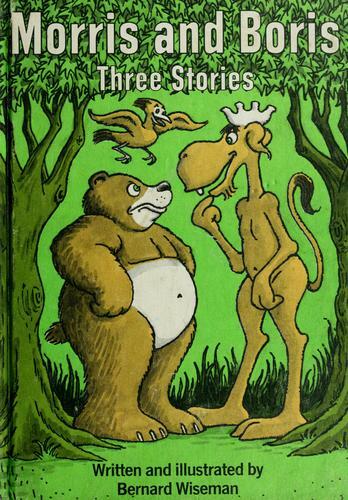 My two other favorite Morris and Boris stories to tell with puppets are Morris Has a Cold and “Morris is a Baby-sitter” (from Morris is a Cowboy, a Policeman, and a Baby Sitter (published 51 years ago!)). Also hard to track down, but worth it. And if you don’t have a moose and/or a bear, it’s fine to substitute others (and still let the audience know where the original story comes from of course). The oversized (9” x 9”) version of this board book is large enough to work well with groups. While Puppy looks for animals on the farm, a die cut circle reveals part of the photograph on the next page, so kids can take a guess. I often like to follow up peekaboo books by repeating the pattern with puppets, and this one offers a chance to add a fun element. So I’ll read the whole book, then get out my own peekaboo board, which is just a piece of cardboard with a circle cut out of it. I pull a puppet from my bag, but only show a piece of it through the circle. Then after some guesses, I pop up the whole puppet above the cardboard. This has a strong connection to the book, but allows you to expand and play with it a little. If the kids don’t guess it right off, you can show a different piece of the puppet through the circle. Just Fish’s scales might stump them, for example, but revealing more of his head makes it more guessable. Then you can finish by popping the whole puppet up above the cardboard. You can also go more 3-d and put pieces through the hole, such as Monkey’s tail or Turtle’s head. This is also one of those Follow-Ups that parents and caregivers can replicate easily at home, using puppets, stuffed animals, or whatever. Suggesting and modeling parent-child activities that generate from a book can be really effective in a Toddler Time setting. I like to think that some parents do try something similar at home after reading a peekaboo book like this…or even better, that the child initiates it. I think of Finger Stories as sort of a cross between fingerplays and puppet stories. Like fingerplays, the kids move their fingers along with you…but there’s a bit more story to them, and the motions are similar to simple puppetry. The Three Little Pigs is a great example. Lots of kids know the story already, and I’ll usually quickly summarize it first anyway just to be sure. Then I show them who the characters will be: First Little Pig is your pinky; Second Little Pig is pointer; Third Little Pig is your thumb. And we’ll use our other hand for…The Big Bad Wolf. He’s all four fingers and your thumb, making a sort of mouth. The tale works especially well as a finger story because the repeated pattern gives kids a chance to practice the same series of motions a few times. Also the characters are distinct and you never need to have more than two “on stage” at a time. By the time you reach the final scene and have Wolf climb up on the roof, many of the kids are comfortable enough with telling it this way that they will “climb” their hand up the imagined house without even needing to be told. Kids catch on at different levels, though, and that’s one of the cool things about it. If they just don’t get the finger movements, it’s still fun for them just to watch you tell it; and maybe they do join in orally. 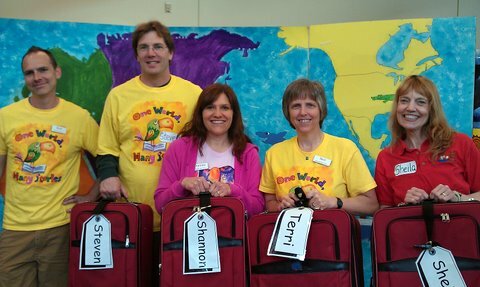 For the kids who do get the motions, it can be a great way to learn and retell a story. It’s also a good way to introduce puppetry to kids. The motions are the same, but without the distraction of actual puppets on your hand. They get the actions and the interplay down first, along with the telling, and then it’s just one simple step to telling it with puppets. Other folktales that work well as Finger Stories include The Little Red Hen, The Three Billy Goats Gruff, and The Three Bears (which is a little trickier because you change characters more frequently and more quickly).